- Anti-slip thick padded handle at one end makes your hand more comfortable and easy to grip the leash. The heavy duty clip at the other end is easy to open and stays shut tightly. Can be separately used as traffic leash. 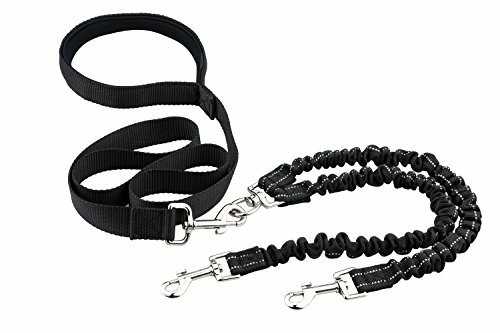 - Two bungee cords are strong and absorb most of the energy, provide more room and prevent choking your dog. Very well sewed, made with tough material and reflective stitching on the leash. - Each coupler leash has a specially designed swivel to keep your dogs from getting tangled up. If your dogs are constantly crossing paths this no tangle swivel is perfect for you. - Have two dog's that are different heights? No problem, each side of leash can adjust to your dogs height. At one inch wide this double leash can handle large and medium dog breeds with no problem. Tangle Free - No more worries about two dogs go in all different directions tangle the leash or wrapping around you and knocking you down. If you have any questions about this product by Ewolee, contact us by completing and submitting the form below. If you are looking for a specif part number, please include it with your message.